Do you love, but can’t afford, the look and features of platinum? 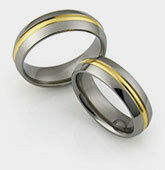 Titanium rings are the perfect solution. The two metals are amongst the strongest natural elements found. Their hardness makes them nearly indestructible, and perfect for rings, as they are completely resistant to scratching or bending. Titanium is even similar looking to platinum, with only a slightly deeper, richer shade of the silver hue. However, titanium costs only a fraction of what platinum does, making it a much more viable option for many jewelry shoppers. 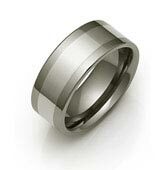 Just like with platinum, titanium rings are available in a nearly limitless variety of styles and designs. 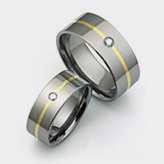 Customers shopping at Titanium Style are given a variety of options for customizing each of their bands. Customers start by choosing one of the three different grades of titanium used by Titanium Style: Aircraft grade Ti-64, the hardest alloy Ti-662, and pure titanium Ti-999. All of Titanium Style’s rings are hallmarked with their specific grade and type of metal and their karat mark, guaranteeing the purity and quality of the alloys used in their formation. 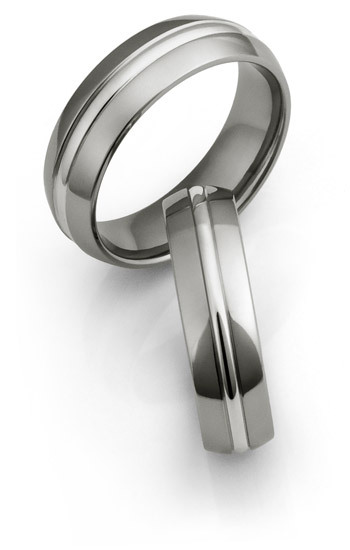 After choosing a metal, customers can choose a band width and then make style decisions. With so many options available, it is easy for the buyer to design the ring to reflect their own personal style and taste. Adding an inlay of other metals is a popular idea. An inlay of a contrasting metal, such as yellow gold, makes a striking impression. 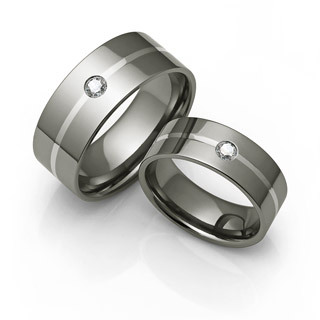 When a more subtle inlay is chosen, such as platinum titanium rings appear more understated and sophisticated. Titanium Style even offers ceramic and rubber inlays, which results in an eye-catching band with the bold black against the smoky silver. Other features customers may opt for include the addition of grooves and picking their choice of edges and finishes. For those who like a little flash, a jeweled stone can also be added to any of the titanium bands. With so many different combinations, each ring is truly a special and unique piece of jewelry which will last a lifetime. 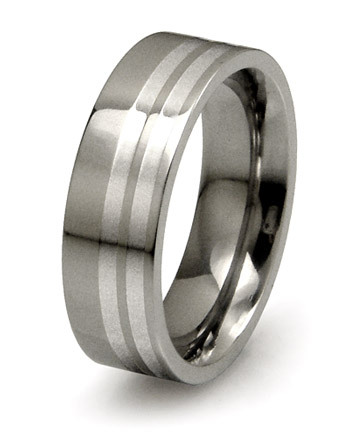 As with platinum titanium rings are hypoallergenic, making them perfect for all skin types. All of the jewelry created by Titanium Style comes with a Certificate of Authenticity and a Lifetime Warranty, allowing their clients to buy with complete confidence they have purchased a beautiful and high quality piece. 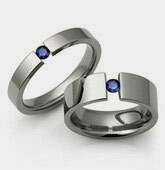 Titanium Style is an online Titanium Rings store. We specialize in custom titanium ring design, inlaid titanium rings, black ceramic rings, titanium wedding bands, chains, necklaces, bracelets, tungsten rings, and more.